Traffic counts in El Dorado County are down significantly over the past few years. Traffic counts determine traffic impact fees because they track the level of use on the roads. Traffic congestion has decreased to levels below when impact fees were passed. As a consequence, the legality of mitigation fees is in question. Most local roads have 5 years of declining trip counts. Many of those traffic counts drop below 2003 levels (El Dorado County Traffic counts). Mitigation fee laws require studies and findings that justify the need for fees. In short, there must be a need for the fee and it must be used to mitigate the impacts of new development. At issue is the forecasting for the massive need for costly infrastructure we are building in El Dorado County. Erroneous forecasting resulted in high mitigation fees now, which are now being charged. However, the county’s failure to act on required fee updates and decreased auto trip count data has allowed the fees to remain high and continue at high rates. We detail these issues below and label them as abuse instances. El Dorado County Supervisors ascribed a 1.03% growth rate for all transportation zones. However, El Dorado Hills Transportation Zone 8 shows growth rates 10 times greater than some outlying transportation zones allowing other zones to pay for El Dorado Hills zone 8’s impacts. This is a violation of the nexus requirements and provides preference to zone 8 fee payers (reduced fees). See the maps! They include growth charts for each zone in the lower right corner. Maps were provided by the EDC Surveyors Office. The government code requires a 5-year update and annual review with a public hearing so fees may be validated or protested. The government code indicates fees should be returned if the 5-year update is not performed. The County Department of Transportation (DOT) was over FIVE years behind in producing a 5-year update. No effort has been made by DOT to refund the fees. However, a lawsuit was filed Austin V El Dorado County and a tentative ruling was published. The Mountain Democrat published the news on 11/8/17 and the decision means impact fees will likely be returned to roughly 10,000 properties. The plaintiff estimates $30,000,000 in fees will be returned to citizens. Two other lawsuits have been filed with Friends of El Dorado County as a co-plaintiff in one of the suits. The trip counts are declining over the long term and forecasting positive trips is near impossible from a negative statistical trend-­line. DOT is forced to wait for a statistical trend to turn positive. However, trips have continued to decrease and the failure to account for those declines becomes a compounding problem for the county. Failure to process the required 5-year update, and trip count declines, allows for the exploitation of residents paying impact fees. DOT’s declining traffic counts are on their web site under Traffic Counts. There is consideration for the dramatic changes happening to our workforce. “Work at Homers” now constitute about 10% of El Dorado County’s workforce. Retirees are prevalent in El Dorado County and they are generally not commuters. We use the Census Transportation Planning Package (CTPP) to determine that the current number of work at home residents is around 8,000 out of 81,000 workers or about 10%. The rapid change in employment characteristics is reducing our need for transportation infrastructure and it is evidenced in trip counts. The El Dorado County Department of Transportation is charging impact fees on Highway 50, although on-ramp and off-­ramp counts indicate total trips are down about 12,000 ticks a day below 2003 levels (2015 ramp counts -­‐ Cal Trans). The ramp counts, which are completed every three years by Cal Trans, demonstrate Highway 50’s congestion is abating as transportation impact fees were increasing. We document Cal Trans trip counts on the HWY 50 ramps to show local traffic impacts to HWY 50 decreased. Transportation Impact Fees (TIM Fees) are justified by the county making findings about the need for infrastructure which for the most part is determined by GROWTH in residential units. When we examine the count of residential units built in each traffic zone we find about 4,000 missing units in the NEXUS STUDY (pg 170). The nexus study quote below relates the importance of the historical growth. We believe the new 2017 impact fees will have to be re-done. We are giving the county the opportunity to repair the fees. Saratoga, a parallel capacity 4-lane divided parkway has taken longer to complete than the Loma Prieta, the Bay Bridge, and I-5’s earthquake repairs. The project needs less than a half mile of paving and is a critical to health and safety projects, like connecting residents to hospitals. The county has failed to deliver critical projects in a timely manner, and instead protracted projects that would have substantially reduced congestion on Highway 50. The greatest concern we present is DOT’s 19-year delay in advancing congestion relieving projects. The delays in completion of Green Valley and Saratoga in the 1990’s are documented in county records. According to county documents, funds were redirected to Latrobe Road to benefit development south of Highway 50 (BOS Agenda – 1/17/1995). In 2005, county auditor Joe Harn wrote to the DOT about the failure to complete Saratoga and the importance of the project (attached email and response from DOT Director and 2005 Sac Bee article). 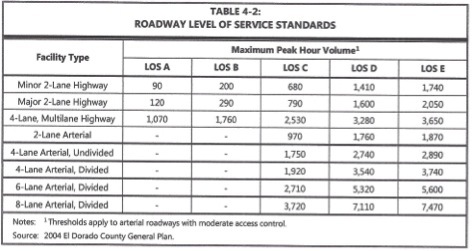 According to El Dorado County’s general plan Level of Service (LOS) standards, Saratoga would carry about 2,000 cars per hour at LOS “C” and 3,500 at LOS “D” or about half of HWY 50’s congestion. Saratoga and Green Valley Roads were removed from the project list in 1995 (BOS Agenda – 1/17/1995). 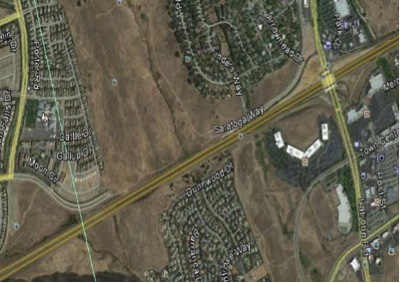 Saratoga would have provided substantial relief at the El Dorado Hills Interchange, had it been completed before the overpass work. The capacity relief that Saratoga would provide for HWY 50 is seen in the General Plan LOS Chart below. Saratoga would provide a direct connection to Iron Point Road to Intel, Costco, and commercial shopping. About 2/3 of traffic going west on Highway 50 dissipates in Folsom and Rancho Cordova (SACOG 2008) emphasizing the importance of Saratoga. We believe Saratoga was stalled for 20 years to keep congestion on Highway 50. We believe this was done to keep fees high and transportation grants coming in. See the January 17, 1995 BOS minutes insisting on accelerating the improvement of Latrobe Rd. According to county documents, the paving length for completion is less than some drive ways. It is about 2,400 feet to complete the road connection. Saratoga is the cheapest and easiest project in our capital improvement plan that would dramatically improve Highway 50’s congestion and onramp access. We believe the failure to complete Saratoga is a 16-year violation of Measure Y’s concurrency requirements with NO help from the Measure “Y” committee members. El Dorado County’s Department of Transportation needs congestion to acquire grants and keep the fees high. Census data, demographic reports, county trip counts, Cal Trans ramp counts, and local building permits all document material inaccuracies with the Department of Transportation’s fee justification data. Finally, please look at the attachments for the Saratoga and Highway 50 trip count documentation.